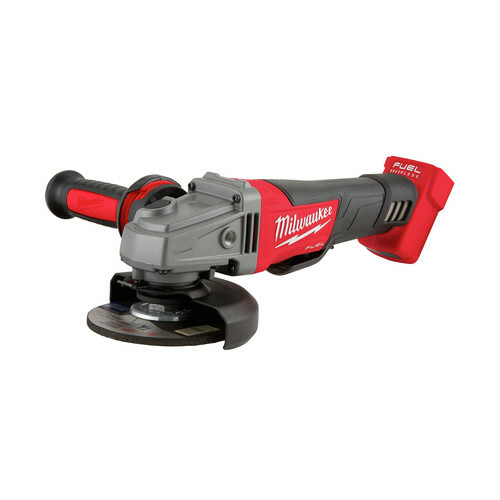 Milwaukee introduces the world's first cordless braking grinder stops accessories in under 2 seconds, delivers the power of a corded grinder, and has up to 10X longer tool life. ?The M18 FUEL 18V Cordless 4-1/2 in. - 5 in. 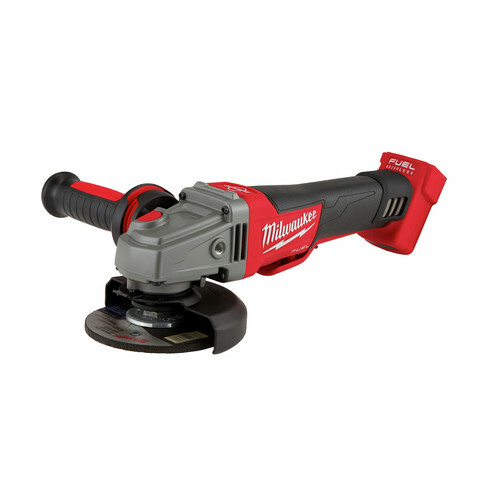 Braking Angle Grinder supplies maximum sustained power to complete the toughest grinding, surface preparation and cutting applications. The POWERSTATE brushless motor provides up to 10X longer motor life and lower cost of ownership. The grinder features REDLINK PLUS Intelligence, the most advanced system of cordless power tool electronics and for maximum performance. A Rapid Stop Brake feature stops accessories in under 2 seconds and it's thin body design gives it optimized balance to rest easily in your hands. The tool-free accessory changes uses the FIXTEC nut and guard adjustments mean less downtime during work. 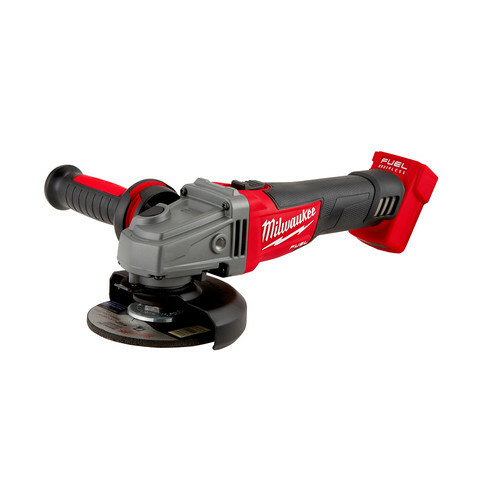 The grinder also has the same tool body, gearing system and anti-vibration side handle as Milwaukee's legendary high-performance corded grinders for maximum durability on the job. Very powerful! Used in many jobs from tight spaces to cutting through very long items. Battery holds up for long uses. More Milwaukee tool for me!! Good grinder like the no tool wheel replacement Feature.The gard adjustment take time to get use to. Lots of power Next tool will be a 9 inch grinder! Yup it's the real deal, strong and stops quickly! I love this tool, it does not bog down like the smaller version of this tool. It runs and feels like a heavy duty grinder. As soon as you release the paddle ,the grinder shuts down very quickly. I can just start welding again, not worrying about putting down and it chewing up my table or work. It's balanced and battery life is all good. Btw - buy the heated jacket! I spent 8 hours in 32 degree weather today. Switched batteries every 2.5 hours, got the job done. Not frozen or wasted, exhausted. We have several of these grinders on the job, and they get used nearly everyday. They make corded grinders cry. They REALLY work well with the 9.0 M18 batteries. We grind and use cut off wheels. Having to not fight a cord is amazing. Powerful as a corded - fast brake relly nice. Powerfull as a corded one. Rugged and very handy for many different tasks. Are the XC 4.0 and XC 5.0 batteries interchangeable in the tools? BEST ANSWER: Yes they all are, from xc to the 9.0 they all work. Yes I have used both batteries in several tools.